Feeling sad: eat a banana! I love to volunteer at races as it always feels so good to give back to the running community. There are a few other perks too – like the cotton tee which has “VOLUNTEER” screened across the back. And, if you’re lucky enough, you can take home leftover bananas. 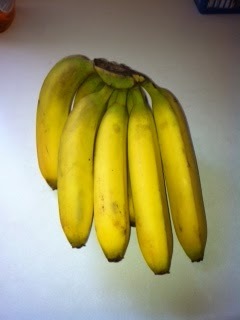 That’s exactly what I ended up with on Sunday: 2 bunches of bananas! 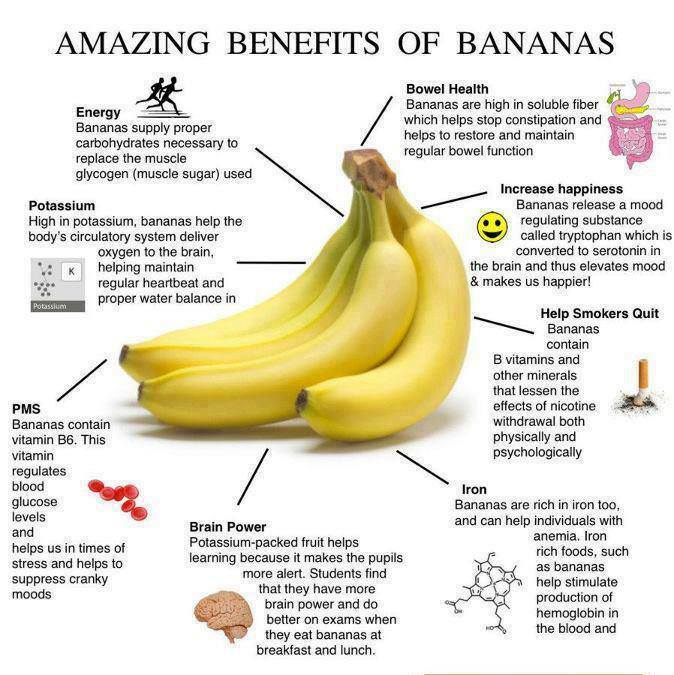 Most people know that bananas are a great source of potassium and energy. But there are many other benefits to eating one. Did you know, for instance, that students do better on tests and exams when they eat a banana for breakfast or lunch? I might have to plant a banana tree outside my portable to feed the monkeys in my classes! 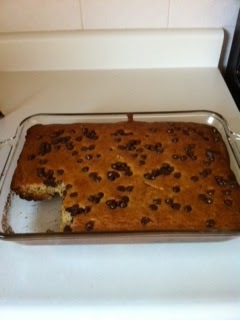 On Sunday night, I got busy baking a couple of pans of banana cake. This is a staple in our house; Skipper will eat it at any time of day (yes, I have caught him eating it for breakfast) and I will often send some home with Coach Kevin. Preheat oven to 350 degrees. Spray 9 x 13 pan with Pam. 1. In a bowl, cream margarine, sugars, eggs and bananas. Beat until light and fluffy. 2. In another bowl, combine flours, baking powder and baking soda. 3. Stir in wet ingredients, alternating with milk, until well-mixed. 4. Stir in 1/2 cup of chocolate chips. Sprinkle remaining chocolate chips on top. 4. Bake in a preheated oven for about 35 minutes (tester inserted in middle comes out clean). Since I baked two pans, I invited anyone from the Toronto Olympic Club to pick some up after practice last night; I now have one pan left. After one bite, Chad said, “Mmmm, this is not going to make it home.” So I went back into the house and filled another plate for him. The rest is quickly disappearing between my own boys and parents’ house. Love bananas! Banana bread looks delicious. Also a staple baked good in our house. I usually make a loaf but I think I will try it in a pan like you did next time.